Mushroom Model Publications is publisher based in the UK. All their books are printed by their associate Stratus Publications in Sandomierz, Poland in English. Stratus does their own line of books in both Polish and English. This book is soft-cover of 184 pages in 8 1/2" x 12 1/2" page format. The cover art is a color photo of 3 F-105D's that are each carrying two 1,000 lb M-118 bombs on inboard wing pylons and a 650 gal fuel tank on center line pylons, ready for takeoff. 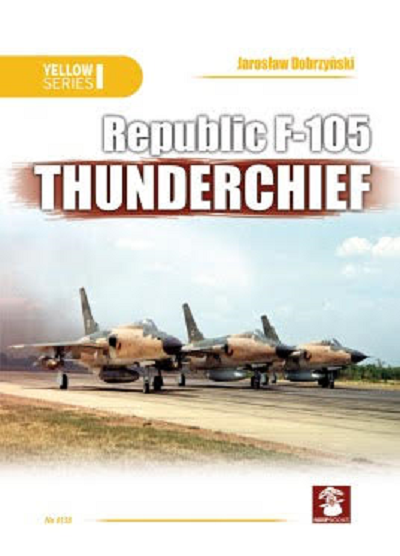 This book is an illustrated technical history of the Republic F-105 Thunderchief fighter-bomber used by the U.S. Air Force. The F-105 conducted the majority of strike bombing missions during the early years of the Vietnam War. The book details the history of the development and service, as well as the technical description with special focus on avionics of this famous Cold War-era fighter-bomber, whose primary role was to be nuclear weapon delivery. But instead saw widespread service as conventional bomber and interdiction during the Vietnam War. Its two seat trainer variant was converted to perform a new mission - suppression of enemy air defense (SEAD) - and proved highly effective in this role. After the Vietnam War, the type served with Air National Guard and Air Force Reserve units until early 1980's. This is a rarely documented aspect of Cold War aviation history. It features superb color profiles of camouflage and markings, walk-around color photos and rare black and white archive photos. There are 125 color photos (including the cover) and 143 black and white ones in the book. It also includes: 28 technical manual illustrations, 8 data lists, 3 maps, an illustration of the "100 Missions" cloth patch, 39 black and white photos of cockpit instruments, a cutaway illustration of the engine, a illustration and color photo of the ejection seats, a illustration of the dash boards in the front and back seats with all the instruments named, color schemes with color swatches, color photos of the front and rear dash boards, 13 black and white illustrations of the instruments and the joy stick and throttle quadrants, a color illustration of "Yankee Air Polak" cloth badge. A YF-105A (54-0078) at Edwards AFB, 1955. A F-105F "Wild Weasel" (63-8301) w/ "Jinkin Josie" and a bare chested girl under the cockpit, pilot Captain Vern Harris, EWO Captain Kim Pepperill, 357th TFS, 355th TFW, Takhli 1968. There is a loose sheet folded twice to fit inside the book. It is a large 22 3/4" x 15 1/2" format, printed on both sides. One one side is a side view of a F-105A, F-105B, 2 side views of a F-105D-10-RE. 2 side views of a F-105D-31-RE (showing it with and without drop tank, F-105D-10-RE and 2 side viees of a F-105F. The reverse side has a top and bottom view in 1/72nd scale of the F-105D-31-RE, 2 side views of the F-105G (one showing its mounted with a AN/ALQ-105 pod and the other mounted with a different pod and a top and bottom view of a F-105F. This is neat book. It will be of great interest to aircraft historians and modelers alike. I wish to thank Dr. Roger Wallsgrove, Editor-in-chief of Mushroom Model Publications (MMP) and the folks at Casemate Publishing who sent me this review sample.